The MLB Playoffs kick off this week with both of the one-game playoffs. The two "play-ins" feature the last four teams in the American League and National League to make the post-season. Two teams from each league face off in a 1-game bout to see who plays in the 5-game Wild Card series against one of the division winners. 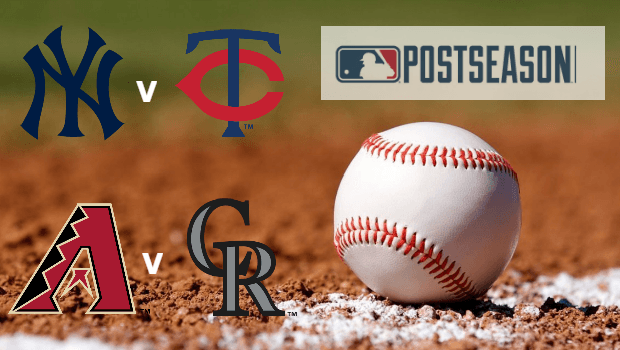 This year's one-game Wild Cards feature the New York Yankees and Minnesota Twins representing the American League and the Arizona Diamondbacks and Colorado Rockies playing on behalf of the National League. The AL winner will face the Cleveland Indians while the NL winners will face off with the Los Angeles Dodgers! The Major League Baseball (MLB) playoffs is when seasoned baseball bettors throw away their rule books and devise a very different strategy to the one they employ during the 162-game season. During those games, it’s possible to find patterns and opportunities for a rewarding wager, but the playoffs shake this up. Even the analysts behind the Moneyball movement are unable to predict the winner given the small sample size. Betting odds are dictated by past behaviour, and with baseball, it’s a case of trying to get the edge on which team’s players have been overrated or underrated! The winner-takes-all American League Wild Card game sees the Twins take on the Yankees at their home stadium in the Bronx. The visiting Twins have the odds stacked against their young clubhouse, coming away bruised with an 11-3 loss against the Yankees in their last meeting only a short awhile ago in September. That game was in the headlines due to an unfortunate accident when a young girl was struck by a rogue ball, but what people may not remember is that the Twins were 3-0 up in the third inning. They are the young guns of the league, but regardless of the players, Minnesota don’t fare well against the Yankees. Bet365 is offering a 21/10 money line bet that they can reverse their fortunes. Given that their starting pitcher Ervin Santana is winless at the new Yankee Stadium despite six starts, his form may be the difference between Minnesota winning or losing. The Yankees, then, are clear favourites, with Bet365 offering 2/5 on the same bet. The past dictates this, given that New York has a winning record against Minnesota for the past decade. If coach Joe Girardi starts Luis Severino and his 100mph fastball, the Twins will need to have a strong hitter to counter it. Unfortunately for the Yankees, this game marks the return of Miguel Sano for the Twins. He’s been resting on the DL since mid August with a shin injury, and yet despite playing only 111 games, the 24-year-old has 28 homers and 77 RBIs. Girardi also has to contend with his primary catcher Gary Sanchez coming off the back of a series of bad luck, which many see as a contributory factor in the Yankees latest 9-6 loss. Despite this, the coach has no intention of changing the line-up, which could prove to be a costly mistake. The odds are much closer for those punters who prefer a run line bet. Sportsbook Bet365 has the NY Yankees at 20/23 with -1.5 runs, while the Minnesota Twins are 20/21 with +1.5 runs. These two National League West sides face off in the second Wild Card game, after the Rockies won their first post-season berth since 2009. They’ll visit the Arizona Diamondbacks at Chase Field in Phoenix, in a game that’s more evenly matched than the one at Yankee Stadium. The Diamondbacks have won 11 out of 19 games against the Rockies this season, bagging the last two comfortably with 8-2 and 7-0 scorelines. Most of the top bookmakers have them at 5/9 for the money line bet. They have judged the visitors at around 8/5 on the money line bet, but they should not be ruled out. Colorado have not been in the post-season in eight years, and now they are there, they’ll want to do something with the opportunity, especially if they can upset the plans of their league rivals. The man to do so would be 25-year-old Jon Gray, with a 3.67 ERA in 20 starts this season with 112 strikeouts in 110⅓ innings. They also have two MVP candidates, third baseman Nolan Arenado and centre fielder Charlie Blackmon, which should make for an exciting game. They also have to contend with Arizona’s starting pitcher, 33-year-old Zack Greinke, who has had moderate success in striking against the Rockies. He's currently 2-1 with a 3.41 ERA in five starts, and Colorado hit .229 against him. More significantly, he has never allowed either of the Colorado MVP candidates, Arenado or Blackmon, a home run. The run line betting odds at Bet365 has the Rockies at 20/27 with +1.5 runs, while the Diamondbacks are at 23/20 with -1.5 runs. The winning team of the NLW Wild Card will go on to pitch against the Los Angeles Dodgers. If you think you know which starting pitchers are going to steal the show or the hitters who’re going to strike their team to success, why not visit Bet365 now? If you join today, Bet365's sportsbook is offering a 100% first deposit bonus up to £200!